April McBride has suffered a broken engagement once before and fully intends to guard her heart when she travels to Lewistown, Montana, to attend her brother's wedding. One look around the small mining town convinces April that this won't be difficult--just a bunch of dusty shops, bad service, and ill-bred cowboys. But a run-in with a horse trainer named Wes Owen opens up vast possibilities for frustration, embarrassment, friendship, and ... love? Can April and Wes see past their differences in order to envision a future together? Readers will love going on this adventurous, spark-filled ride through turn-of-the-century Montana. About "A Love of Her Own (#03 in Heart Of The West Series)"
Maggie Brendan is a member of American Christian Writers and the American Fiction Writers Association, and is a contributor to www.bustlesandspurs.com, a website for inspirational romance in the old West. You can read her blog at southernbellewriter.blogspot.com. She is the author of No Place for a Lady and The Jewel of His Heart, and lives in Georgia. 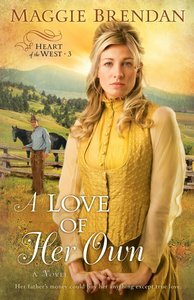 Customer Reviews For "A Love of Her Own (#03 in Heart Of The West Series)"
This is the third book in Maggie Brendan's 'Heart of the West' series. In it, we follow April McBride (who we met in the first book of the series) to Montana to attend her brother's wedding. April is still  broken-hearted after the broken engagement featured in 'No Place for a Lady', so she is definitely not interested in men. She faces a run of unfortunate events on her journey to Montana, and arrives just in time for the wedding. She comes from a rather well-off situation, in which she has been rather spoiled, and finds her current situation quite primitive and beneath her. Until she meets some quaint and lovable characters during her stay in a boarding house. She also finds herself drawn to a likeable rogue, the horse trainer Wes Owen, who has his own story and struggles in life. Brendan takes readers through a range of emotions along with April. We laugh and cry and delight in watching her grow as a person and as a woman ready at last to love again. I loved this series of books set in the old west. You get to know the characters and I was sad when I finished and there could have been more.